We Drink Your Milkshake! 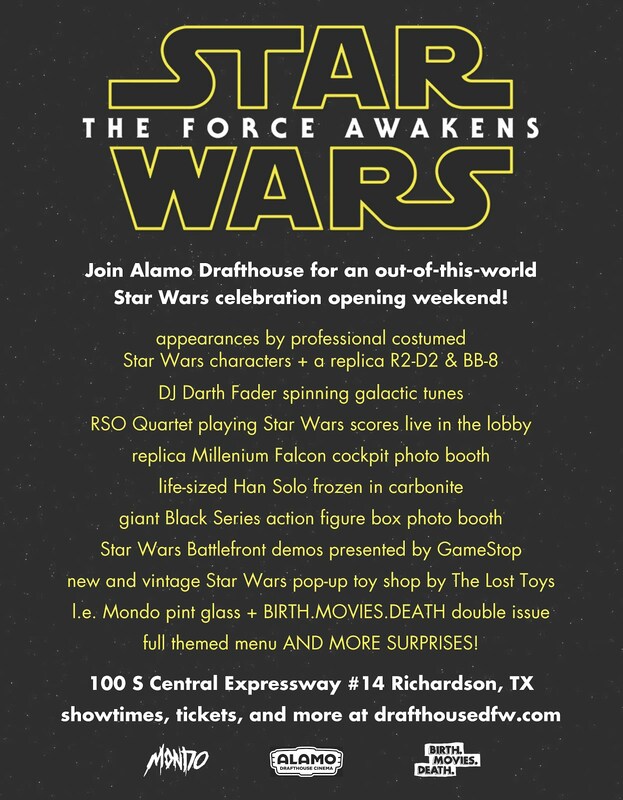 : The Local Haps: STAR WARS: THE FORCE AWAKENS Festivities! The Local Haps: STAR WARS: THE FORCE AWAKENS Festivities! Guys. STAR WARS: THE FORCE AWAKENS is about a week away, and do you have your tickets yet? I'm sure you do. Well, not only is this going to be one of the most anticipated movies of the year, but The Alamo Drafthouse has multitudes of celebrations going on during the whole opening weekend. So even if you didn't get your tickets for opening night, all the festivities will be happening all weekend. Featuring professional costumed STAR WARS characters, photo ops, the RSO string quartet performing live in the lobby, themed menu, limited edition exclusive merchandise, opening-day lobby party and more! 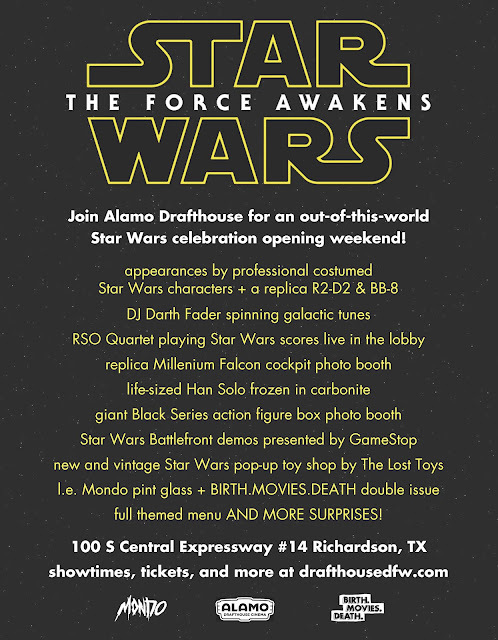 The Force is strong with the Alamo Drafthouse opening weekend festivities for STAR WARS: THE FORCE AWAKENS! Opening day—December 17—will feature an old-school lobby party kicking off during the day featuring professional costumed STAR WARS characters, DJ Darth Fader spinning intergalactic tunes, STAR WARS Battlefront demos presented by GameStop, new and vintage STAR WARS pop-up toy shop by The Lost Toys, Hop Solo Pint Night presented by No Label Brewing Co. in Glass Half Full and much more! Appearances by a North Texas chapter of professional costumed STAR WARS characters will occur throughout the day Thursday, as well as Friday through Sunday. Fans can have their pictures taken with all their favorite characters from a galaxy far, far away including Stormtroopers, Boba Fett, Darth Vader, Jedis, X-Wing Pilots, R2-D2, and BB-8 just to name a few! And they can do so with multiple photo ops in the lobby including a life-size replica of the Millennium Falcon cockpit, a life-size replica of Han Solo frozen in Carbonite, and a giant version of the STAR WARS Black Series action figure box (presented by the Credit Union of Texas). About Alamo Drafthouse Cinema:Tim and Karrie League founded Alamo Drafthouse Cinema in 1997 as a single-screen mom and pop repertory theater in Austin. 17 years later, the now 19-location chain has been named "the best theater in America" by Entertainment Weekly and "the best theater in the world" by Wired. The Alamo Drafthouse Cinema has built a reputation as a movie lover's oasis not only by combining food and drink service with the movie-going experience, but also introducing unique programming and high-profile, star studded special events. Alamo Drafthouse Founder & CEO, Tim League, created Fantastic Fest, a world renowned film festival dubbed "The Geek Telluride" by Variety. Fantastic Fest showcases eight days of genre cinema from independents, international filmmakers and major Hollywood studios. The Alamo Drafthouse's collectible art gallery, Mondo, offers breathtaking, original products featuring designs from world-famous artists based on licenses for popular TV and Movie properties including Star Wars, Star Trek & Universal Monsters. The Alamo Drafthouse Cinema is expanding its brand in new and exciting ways, including Drafthouse Films which has garnered two Academy Award nominations in its short three year existence and Birth.Movies.Death, an entertainment news blog curated by veteran journalist Devin Faraci. It's one of those films you need to be part of, and having people wanting to speak about it, it's the reason why I do what I do.Source for more about shorts-filmfestival. The assortment of movies is quite good even you will discover the recent release.If you are more curious about solarmoviecom then you can learn more about it on solarmoviecom.com.